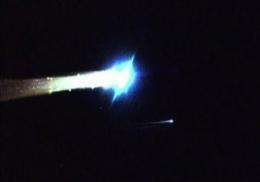 An image grab from video footage released by NASA shows a heat-resistant capsule (right) speeding towards Earth after being ejected from Japan's Hayabusa spacecraft (left). The Japanese space capsule that has travelled around the solar system as part of the first mission to land on an asteroid and return to Earth has been collected by scientists in the remote Australian Outback. The pod was ejected from a Japanese space probe as the host vessel burned up in a spectacular display over Australia following a seven-year odyssey across the solar system to the far-off Itokawa asteroid. It lay in the desert dust overnight before scientists were given the go-ahead to retrieve it after Aboriginal elders said it had not landed in any indigenous sacred sites. "The capsule is deemed intact at the moment," the Japanese space agency JAXA said in a statement. The heat-resistant capsule parachuted into South Australia's remote Woomera military zone after being released from the Hayabusa spacecraft, which flamed back into the planet's atmosphere late Sunday. The director of the Woomera test range, Doug Gerrie, said the probe had completed a textbook landing in the South Australian desert and had avoided any sensitive sites. An aerial video of the speeding sample return capsule released by NASA. "They (JAXA) landed it exactly where they nominated they would," he said. The Hayabusa, which was launched in 2003, has endured a series of technical mishaps over its five-billion-kilometre (three-billion-mile) journey to the ancient Itokawa asteroid. After visiting the site to retrieve the capsule, Hitoshi Kuninaka, professor at JAXA, said it "bears no damage at all", in comments reported by Kyodo News agency. "Though it was flipped vertically, maybe because of a bounce on landing, it caused no inconvenience. It was left very clean," he said. Fears for the return journey kept watching scientists anxious and Yoshiyuki Hasegawa, JAXA's associate executive director, said when they knew the capsule had made a better-than-expected soft landing, "we were very happy". He said excitement had been high because the craft had only been designed to last four years and there were concerns about whether its battery would last the full seven years or if its control system would malfunction. It is still not known whether the craft was able to collect a sample from Itokawa, but any material it does have could shed light on the early history of the solar system, the formation of planets, and help reduce the threat of asteroid collisions in the future, scientists say. Australian National University scientist Trevor Ireland, who watched the spacecraft's re-entry from the Outback town of Coober Pedy, said it looked like a meteor as it flashed orange across the night sky. "It looked just like that in terms of fragmentation and pieces flying off it and glowing, it was just absolutely amazing," Ireland told AFP by telephone from Woomera. Ireland said the mood among the international scientists studying the craft was "hyper" after the capsule landed, successfully deploying its parachute and signalling systems so that it could be found in the vast Outback. "It was a huge worry that the parachute wouldn't go off, the (signalling) beacons wouldn't go off, and that it would come down in a mud lake and get lost in the landscape," he said. Ireland said scientists were now abuzz about what the capsule may contain. "If there is a sample in there that we can analyse that will be a bonus," he said. "It's already been a tremendous mission. It really is a fairy tale." The historic mission means that for the first time a spacecraft has made contact with an asteroid and returned to Earth. The re-entry was hailed in Japan, where the government's top spokesman, Chief Cabinet Secretary Yoshito Sengoku, said the spacecraft's travels had "given courage, dreams and hope to us". In celebration, a Japanese sake rice wine maker has produced a special Hayabusa edition for fans who want to toast the probe's return to Earth. The capsule, which will remain sealed until it arrives at the JAXA facility near Tokyo, may remain unopened for weeks as it undergoes rigorous testing. If there is material inside, it will take JAXA until around September to determine whether or not it came from the asteroid, Kyodo reported. anyone know how it was supposed to take material from the asteroid?? It landed on it and used a scoop, then took off with the scrapings. Think back to your childhood, when you hit the beach with your play shovel and pail and dug a hole -- wait, that was last weekend, wasn't it?